Do you need some help constructing your resume? Get ideas from this sample resume for a midlevel civil engineering professional. To be a successful candidate for engineering jobs, resume expert Kim Isaacs says it helps to have a comprehensive resume. Do you need some help constructing your resume? 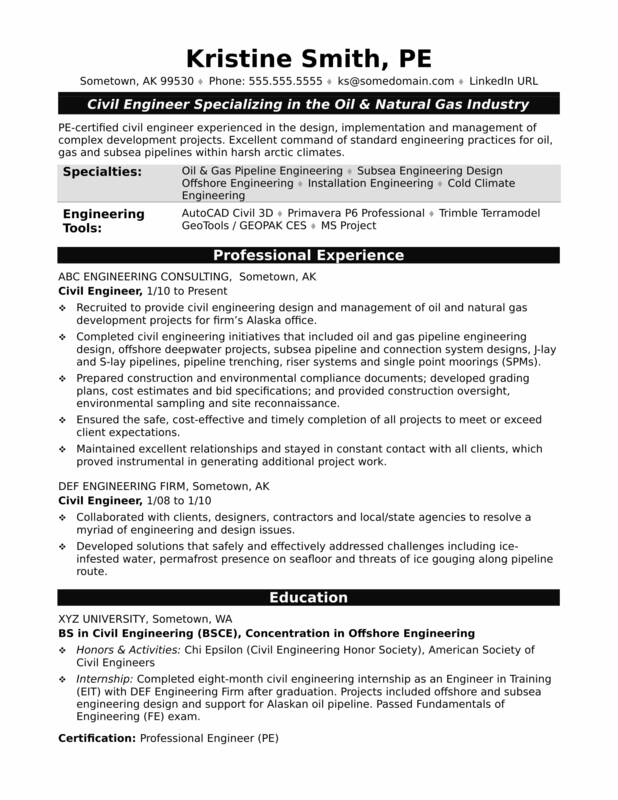 Get ideas from this sample resume for a midlevel civil engineering professional that Isaacs created below, and download the midlevel civil engineer resume template in Word. And if you need more help, get a free resume evaluation from the experts at Monster's Resume Writing Service. Jobs for civil engineers are projected to grow by 11% (or 32,200 jobs) from 2016 through 2026, according to the Bureau of Labor Statistics (BLS). You’ll find the highest level of employment for this job in the following states: California, Texas, Florida, New York, and Pennsylvania; and in the following metropolitan areas: New York City, Houston, Los Angeles, Chicago, and Atlanta. As a civil engineer, you can expect to make a median wage of $84,770 per year, or $40.75 per hour, according to the BLS. Additionally, you can learn more about engineering careers and search for civil engineer jobs on Monster. PE-certified civil engineer with more than four years of experience in the design and management of complex development projects. Excellent command of standard engineering practices for oil, gas and subsea pipelines within harsh arctic climates. Recruited to provide civil engineering design and management of oil and natural gas development projects for firm’s Alaska office. Completed civil engineering initiatives that included oil and gas pipeline engineering design, offshore deepwater projects, subsea pipeline and connection system designs, J-lay and S-lay pipelines, pipeline trenching, riser systems and single point moorings (SPMs). Prepared construction and environmental compliance documents; developed grading plans, cost estimates and bid specifications; and provided construction oversight, environmental sampling and site reconnaissance. Ensured the safe, cost-effective and timely completion of all projects to meet or exceed client expectations. Maintained excellent relationships and stayed in constant contact with all clients, which proved instrumental in generating additional project work. Collaborated with clients, designers, contractors and local/state agencies to resolve a myriad of engineering and design issues. Developed solutions that safely and effectively addressed challenges including ice-infested water, permafrost presence on seafloor and threats of ice gouging along pipeline route. Internship: Completed eight-month civil engineering internship as an Engineer in Training (EIT) with DEF Engineering Firm after graduation. Projects included offshore and subsea engineering design and support for Alaskan oil pipeline. Passed Fundamentals of Engineering (FE) exam in 2008. Professional Development: Ongoing training has covered topics including ISO 9001, OSHA requirements, tunnel design and hazmat. Civil Project Engineer - Civil Const Leader GREAT Comp/Benefits!